Just yesterday we covered the news on Airbnb giving away four tickets each to 10 lucky Singapore winners to Bali. 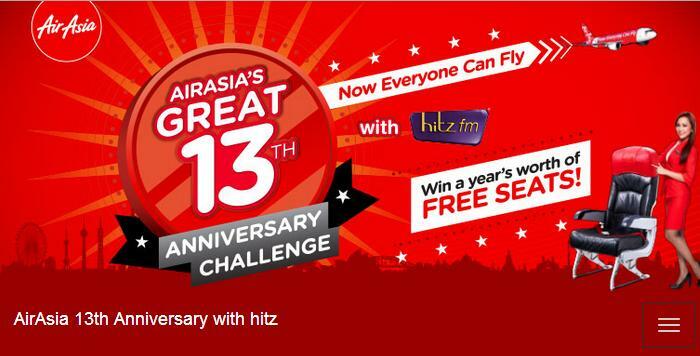 Well, not to be outdone by Airbnb, we found out that Air Asia Malaysia recently came up with its 13th Anniversary Challenge that’s giving away a year’s worth of free seats with Air Asia. The duration of the contest is from 24th of November 2014 to 13th December 2014 but the entry deadline is set on 7th December (that’s this Sunday!) so you still have five days to get your name in the running! All you have to do is fill up the form here with your most creative response on why you deserve to win a year’s worth of free seats, and be in the top 12 finalists to stand a chance to win. The prizes include 1 year’s worth of free seats to your dream destination, 1 cabin sized Expedia Suitcase (worth RM500), 1 AAGO e-voucher (worth RM500) and 1 year free travel insurance by Tune Insure Malaysia Berhad. That sounds pretty amazing to me. I had a suspicion that ‘last one standing’ was meant to be taken quite literally, as in the last person to get up from their seat. Checking the terms and conditions confirmed my guess. 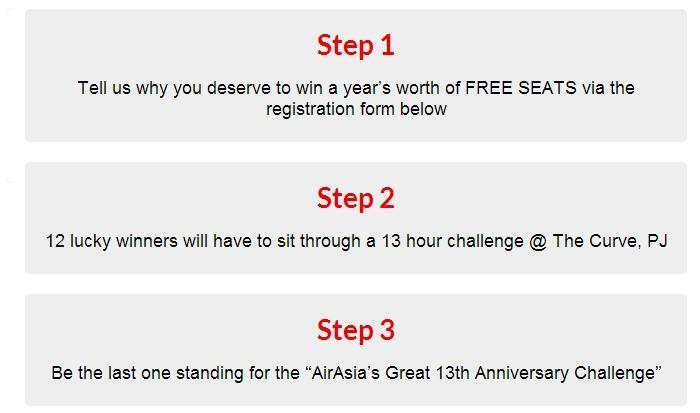 In order to win, it the contestant will have to be seated for the entire 13 hours (in accordance with the game mechanics as set by the Organiser at the AirAsia’s 13th Great Anniversary Challenge). How’re they going to pee?! Yeah, peeing is for losers. Try it out and see if you’re luckily enough to be in the 12 Finalists! We’re pretty sure the “in accordance with game mechanics” allows the contestants to take toilet breaks so don’t let us scare you off with that comment.